Fatimid pottery cup, 11th century. One of the special qualities of the leopard is that if it wounds a man, and a mouse urinates on the wound, the man will die. A mouse never gives up trying to reach a man wounded by a leopard: one person, out of fear of the mice, even had a bed made for himself sitting in the water, with cats tied all around it. -Usama ibn Munqidh, The Book of Contemplation, p. 123-124. Trans. Paul Cobb, 2008, Penguin. 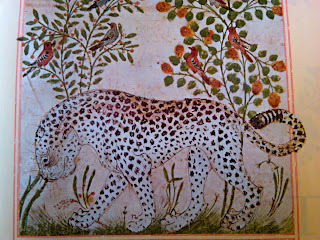 Leopard, from "The Benefits of Animals"
"The leopard is a fierce enemy of man, unmanageable and ferocious. He eats only his own game. 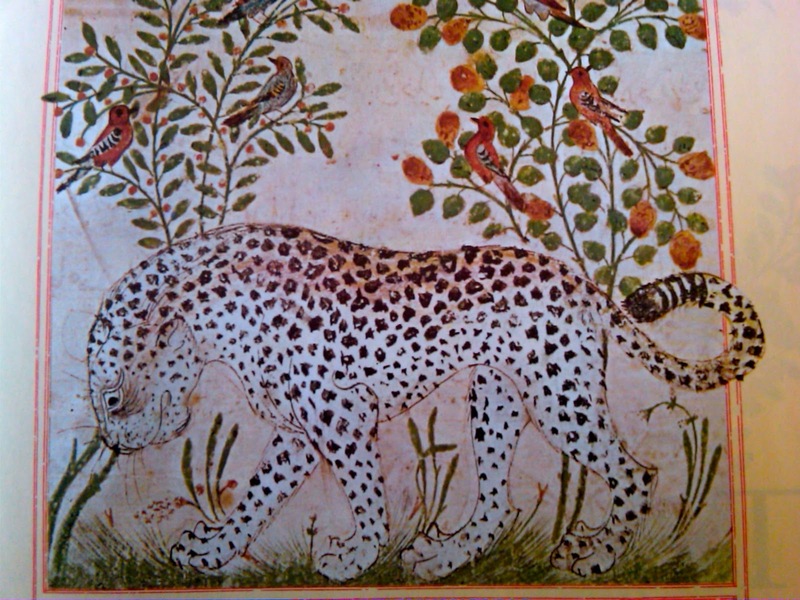 When satiated, he sleeps for three days and three nights in succession; (...) A sick leopard gets well by eating mice. His skin is tender and if he is wounded it breaks with a slight stroke. The flesh and fat of a leopard, boiled in the juice of olives, serve as a good salve for the sores, abcesses and pimples that break out on the body; his blood is a preventive liniment for all skin diseases." -Ibn Bakhtishu, The Benefits of Animals, quoted from 1001 Tales of History's post on the book - which you should totally check out, if only to see the other fascinating pictures and descriptions. Well. There's clearly something up between leopards and mice, some connection here. But why would these two creatures be connected? Clearly the Mouser is misremembering (or the witch misspoke) and it was leopards, rather than panthers, that were in the adept chain of succession. But what if there were some way to short-circuit this process? What if an adept-turned-leopard-turned-mouse could easily slay a man while as a mouse? Perhaps through a wound that they had made as a leopard? And this would explain why the mice never give up trying to reach the wounded man. Because if they can work their arts on the wounded...ah, the chance to be a human once more! I am wary about the direct symmetry, though - I think that it might gain more through being a unique and one-off thing, "that's just how adepts roll," because of how contrary to nature it is - the prey slaying the predator.